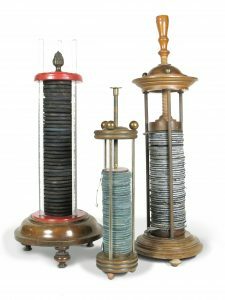 In 1800 Italian Physicist Alessandro Volta developed the voltaic pile, a forerunner of the electric battery. The first pile consisted of a number of discs of zinc and silver separated by pieces of wet paper and arranged in a vertical column. This was the first device to produce a steady stream of electricity (direct current) and could operate for decades. In honor of his work in the field of electricity, Napoleon made him a count in 1801. In 1893, the electrical unit known as the volt was named in his honor at the International Electrical Congress held in Chicago, Illinois.